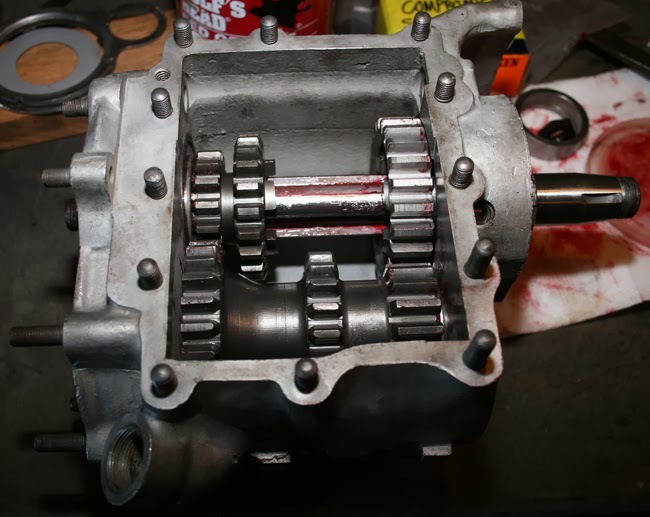 Pictured above is the result of a full day of work, a completely rebuilt three-speed transmission. The day started with a pile of parts, both old and new as well as a thoroughly cleaned transmission case. The first step was to install new sealed bearings for the main shaft. These are available from Replicant Metals and are one of the improvements that we made during the rebuild. 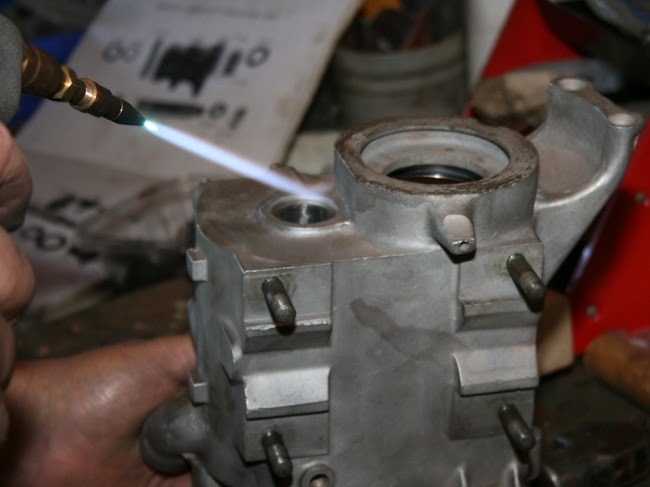 In order to properly install the bearings, the case was carefully heated with a torch while the bearings were left outside in the snow to cool. This next part took a little bit of timing to insure that everything slid in without issue. As soon as the case was hot, it was quickly flipped over and the cold bearing was dropped in and tapped into place with a wooden dowel before it heated up and expanded. 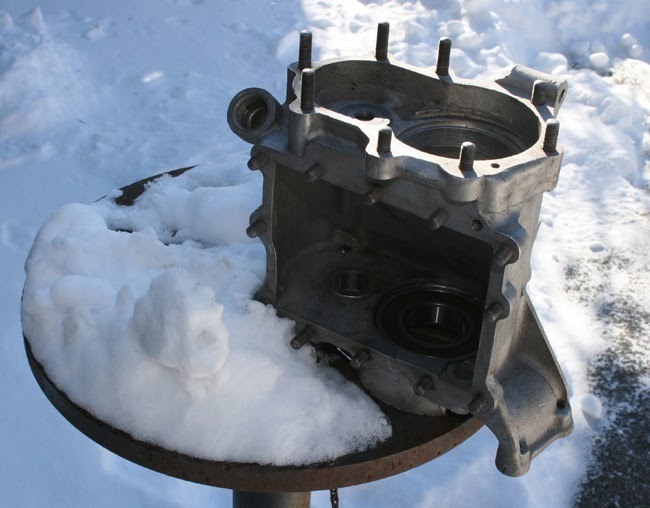 Then the case was set outside to cool (temperature was in the teens) to make sure that the seals in the bearing were not damaged from heat. If you don't have snow on the ground, you can always use your freezer instead. With the case ready, it was time to start filling it with gears. First to be installed was a new main shaft and slider gear from Eastern Motorcycle Parts. As you can see from the next picture, my original slider gear looks pretty worn when compared with the new one from Eastern Motorcycle Parts. Also installed on the main shaft was the main drive gear. Everything was dry fit to make sure that there were not any clearance issues. As expected, the shaft and gears slid together nicely. Next the cluster gear was test fit into the case. There were no clearance issues with the cluster gear either, so we moved on to setting the end play on the cluster gear. 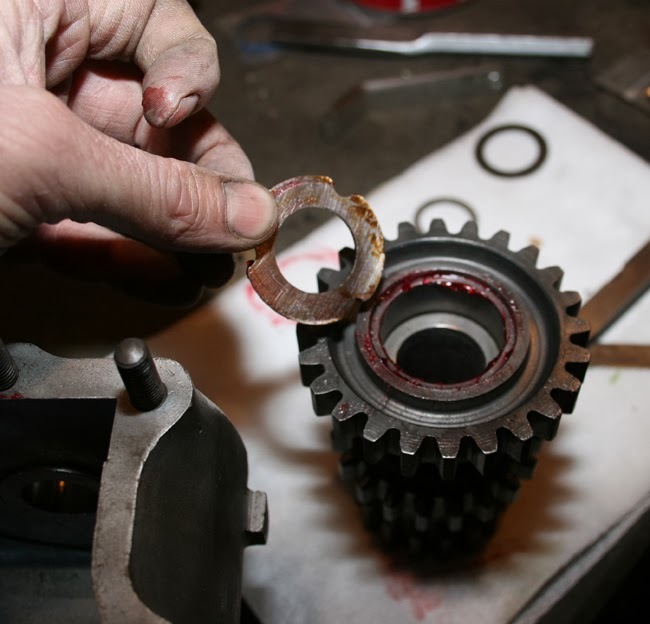 The end play is adjusted using special shims that fit into one end of the gear. 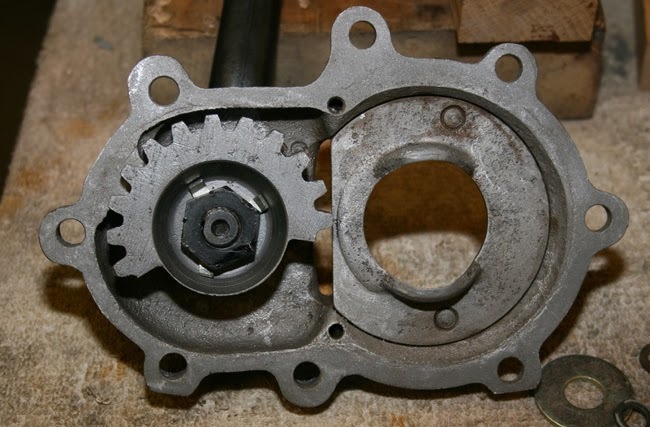 Since the cluster gear rotates on a fixed shaft, it contains roller bearings on each end. 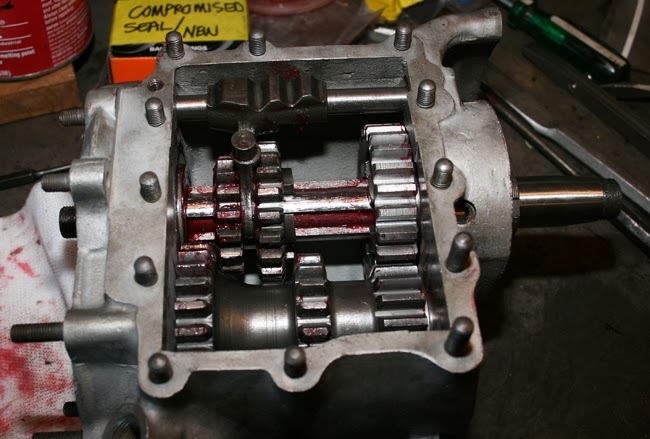 These were installed with liberal amounts of red grease before dropping the cluster gear into the case and running a new counter shaft through it. 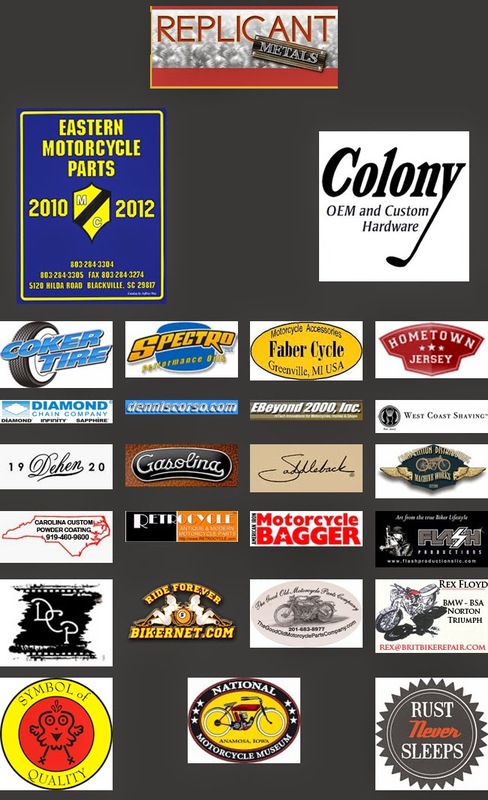 My counter shaft also came from Eastern Motorcycle Parts. 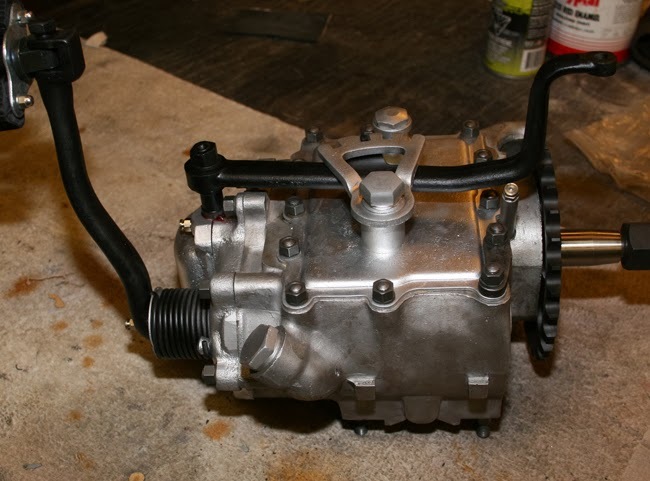 Now it is starting to look like a transmission! 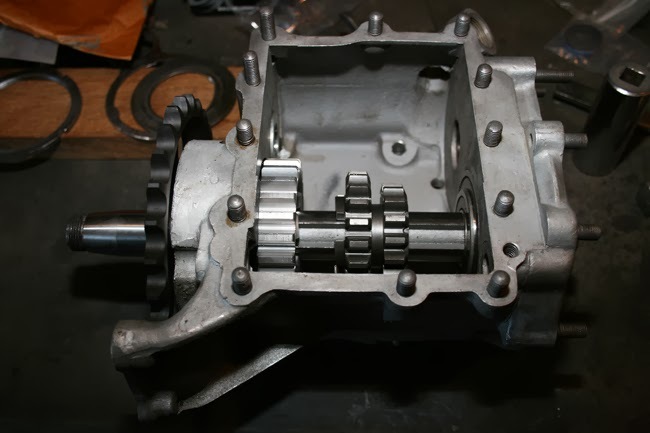 To finish off the internals, the slider gear fork and shaft were installed. The kickstarter assembly was next to go on. 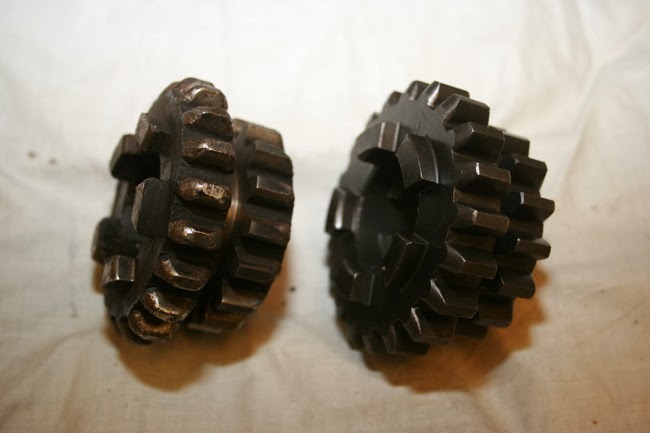 The first step was to finish securing the main shaft and counter shaft with their nuts and lock washers. 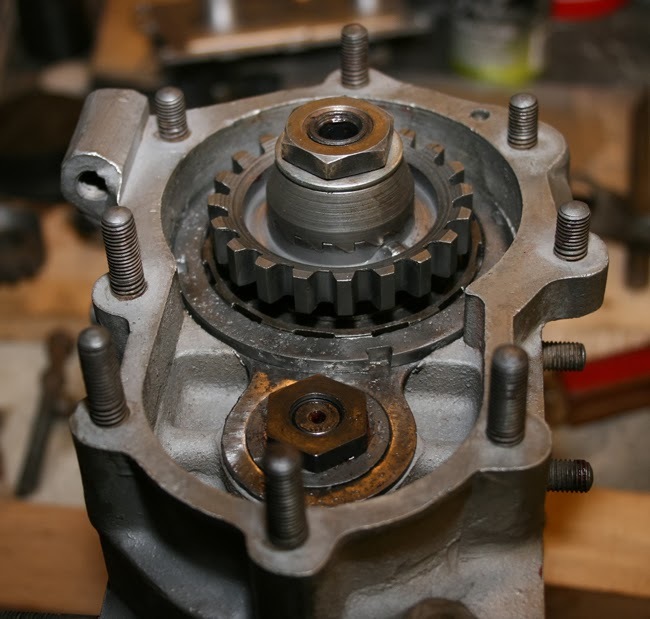 Once the shafts were secured, the clutch spring, kicker gears, washer and nut were all mounted onto the main shaft. There are two keys at the end of the main shaft which must be installed before the washer and nut. 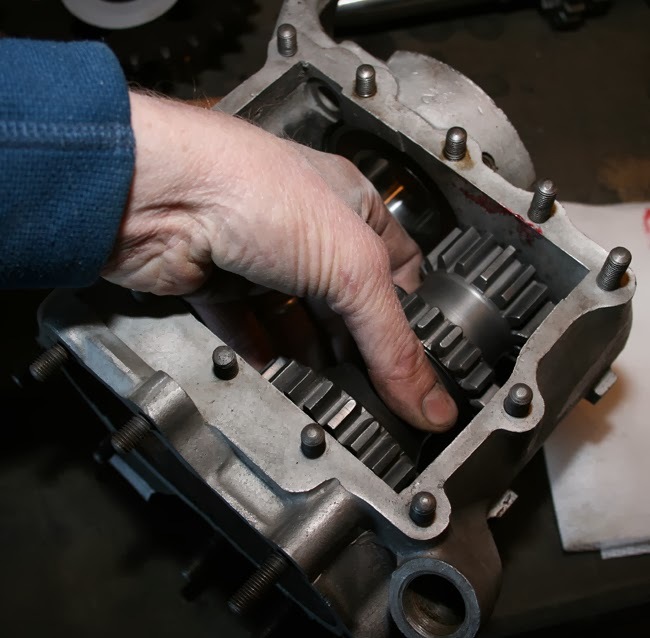 These take at least four hands to install as someone has to hold down the kicker gears to compress the clutch spring while the keys are being put in place. The kicker arm was installed in the kicker cover and then the kicker side of the transmission was ready to be closed up. 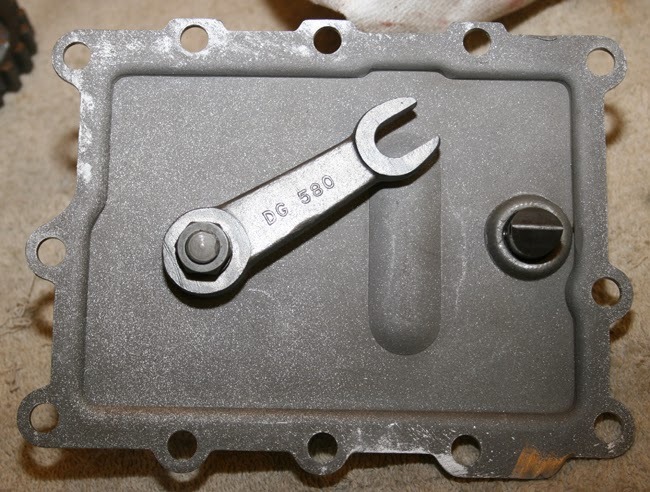 The transmission top cover was one of the last pieces to be assembled. It has a spring loaded sliding gear fork plunger on one end and a gear lock plate on the other. The gear lock plate attaches to the gear shifting fork on the inside which is what moves the slider gear on the main shaft. New gaskets were placed under the kicker cover and top cover before bolting both of them down with OEM HD nuts and washers. The clutch release lever, a few grease fittings and the drive sprocket were installed to finish up the rebuild. 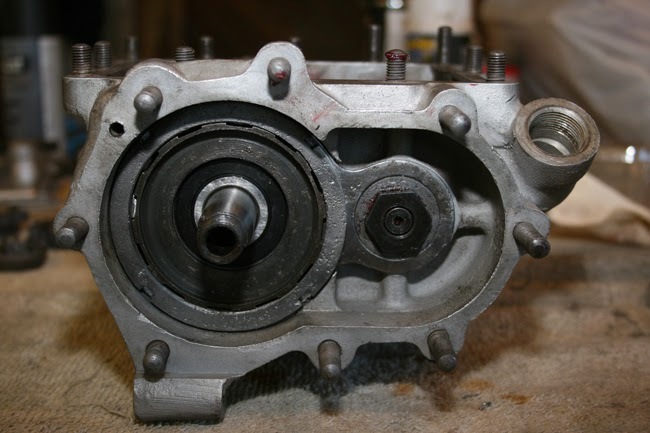 The result is a transmission ready to fill with fluid and install in the frame.